How to attach a digital download to a subscription plan and email the customer a link to the file after purchase. You can attach digital download files to plans in PayWhirl and we will automatically email a link to customers who subscribe. When you create a payment plan in PayWhirl, you have the option to upload a file for customers to download after they subscribe. You can attach a file (up to 100MB) and it will only be delivered to your customer via email after a successful purchase. The link to the attachment is sent along with the "new subscription" email after a customer purchases a plan from your account. 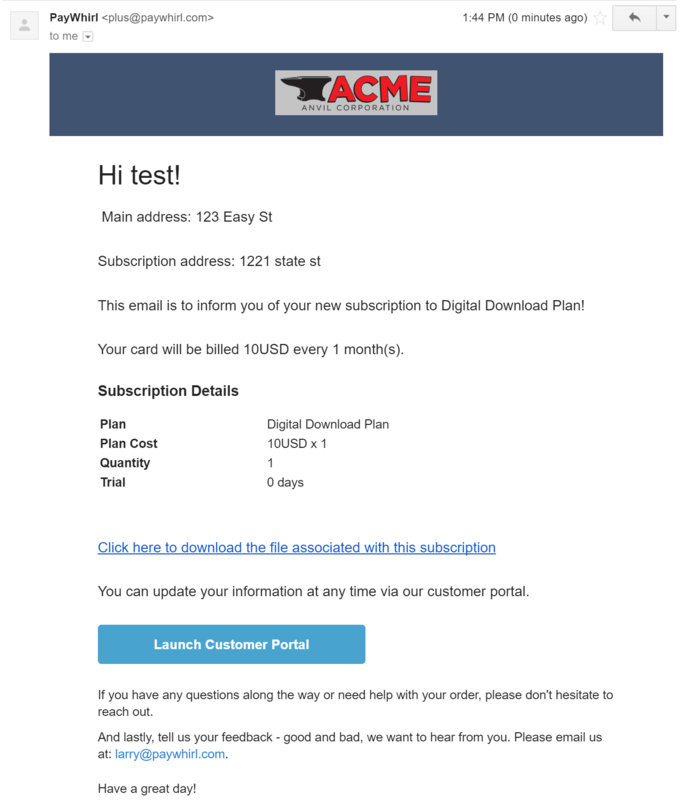 Here is an example of what the download link looks like in the default new subscription email template. You can customize your email templates as needed to make sure the information you need is displayed in each email. The download link is only sent after successful purchases when customers are subscribed to a plan for the first time. If you update the file attached to the plan, it will only be sent out to new subscribers. Existing customers will still have the original email containing the old link. If they unsubscribe and resubscribe they will be sent a new email with the new link. Note: There is no limit to the number of times a file can be downloaded. Let us know if you have any questions about downloads.